Despite the usefulness of these interpretations, the label “cinematic contingency” constricts what it is we’re after in piecing together the aesthetic and perceptual experience of early spectators. After all, what precisely is contingent about the sight of wind, smoke, steam, water, and dust? Do we simply mean that the fluttering of leaves is fascinating because we know it was not planned by the filmmaker, that it makes present to us the autonomy of the world? If so, isn’t there a difference between these fluttering “incidentals” and the stray dog that accidentally finds its way into the otherwise staged scenario of the Lumieres’ Le Faux cul-de-jatte? 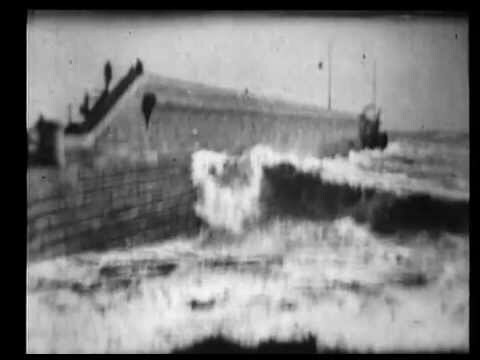 A still from Rough Sea at Dover (Acres and Paul, 1895), one of many popular "wave films." In simply claiming a kind of a sympathy between early spectators’ attraction to incidentals and the “ephemeral, the fugitive, the contingent” as markers of newly modern experience, we run the risk of effacing the perceptual specificity of the wind in the trees. If we are to think about why these particular images were appealing beyond simply rehearsing the themes of “cinema and modernity” or invoking the technological “attraction” of imaged motion, we might look at how certain kinds of ungraspable motion pose epistemological and aesthetic problems even before the invention of motion pictures. How do we ground this seemingly chaotic, self-willed motion in the material world of identifiable causes and effects? And why do we like to look at it? Immanuel Kant briefly attempts to bring these two questions together in his Critique of Judgment. In a rarely cited passage, Kant distinguishes between properly “beautiful” objects and what he calls the “beautiful views” characteristic of “the changing shapes of the fire in the hearth or of a rippling brook,” sights which “continually stirred [the mind] by the variety that strikes the eye.” Kant warns against such sights as mere “charms,” not beauties, because they defy our natural faculty for grasping objects as static, bounded entities—things need to be stilled and identified as things before we can judge them as beautiful things. Looking at a constantly flickering fire, a rippling brook, or the shifting ribbons of smoke emanating from a cigarette, I’m not sure where the object begins and ends, spatially or temporally speaking. Simply put, beautiful views are a problem for Kant because they are formless;their perpetual metamorphosis defies formal unity–the sense of component parts arranged into relations, the sense of the apparent organizedness of things. But this formlessness is equally responsible for the view’s attractiveness: we “never tire of looking at” objects that continuously stimulate the imagination through continuous formal change. But as wonder fades into familiarity, wind and smoke offer little appeal for the contemporary moviegoer. Aside from the cinephilic spectator who devotes attention to the “peripheral details” within the frame, we are no longer collectively distracted by atmospheric incidentals, neither because of the kind of motion they exhibit nor because they make us alert to the that-was-thereness of cinematic contingency. Evoking the marvel of fluidic motion is no longer a condition of the medium but a largely dormant aesthetic potentiality. I want to suggest, though, that the fascination with the incidentals of moving images–with the chaotic movement of particles of dust, the flickering of flames, the rippling of the surface of water—has persisted into the present day, albeit in a disguised form. It’s in the realm of computer-generated images that we retain something of the early spectator’s fascination with fluidic incidentals, not simply because we repeat the early spectator’s marveling at the novelty of representational technology, but because, in recognizing these images as reaching the furthest bounds of non-photographic verisimilitude, we rekindle a fundamental fascination with the limitations of our perceptual faculties as identified by Kant. 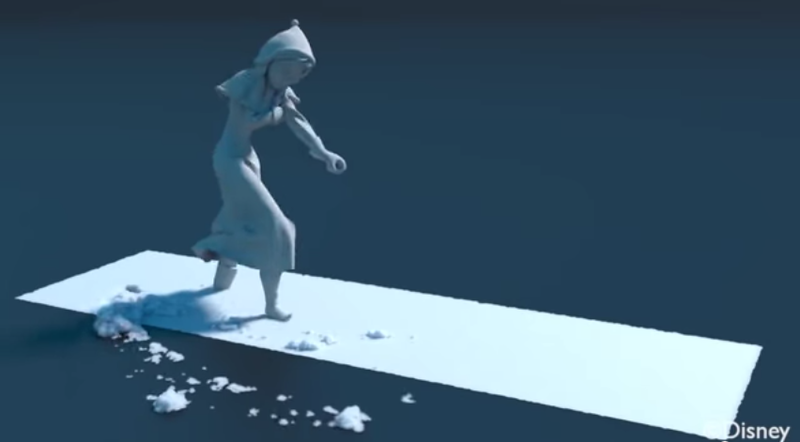 Consider this video demonstrating the algorithms used to generate snow physics in Disney’s Frozen. More than an explanation of scientific principles and algorithmic programming, the video isolates computer-generated snow matter in various tests as aesthetic investigations of ordinary motion. The demonstrations occur in a kind of blank three-dimensional space (colored a neutral black or gray); even the demonstrations involving characters from the film render those figures gray automatons, their volumetric solidity and realistic bodily movements giving their colorless and texture-less bodies an uncanny lifelikeness. The purpose of the figures’ representational deprivation is to shift our attention away from their bodies—that is, both as narratively interesting characters and as primordially interesting human figures—to the physical effects those bodies have on their snowy environments, to the ways that snow particles clump, scatter, stick, and flow. While this video explicitly shows us how to appreciate the physical incidentals of the feature film, I don’t think we can fail to notice—or rather fail to feel, to physically register—the artistry of motion simulation on display in computer-generated animations like Frozen. More importantly, we can’t fail to notice our own perceptual capacity to appreciate such motion in all its incomprehensible complexity. A gray, featureless Anna demonstrates snow physics. Our fascination with computer-generated incidentals is one of the subjects of Harun Farocki’s recent Parallel I, the first installment of a four-part video installation about the history of computer-generated verisimilitude taking us through the increasingly photorealistic animations of wind, fire, smoke, water, and clouds in video games. With each sequence, we track the development of computer-generated animations from a loose configuration of flashing square pixels to animations nearly indistinguishable from their filmed counterparts. Farocki shows us not only the in-game footage but the software used to create these animations, not unlike the Frozen demonstrations. One particularly revealing software demonstration breaks down a simulation of crashing waves into a sequence of differently rendered graphical layers that highlight for us the varying viscosities and velocities of liquid moving simultaneously (particles of mist spraying above, foam gliding along the surface, and the heavy mass of water slowly shifting underneath). This visual analysis illustrates what we already intuitively know, that producing an animation of water in motion that is this convincing requires a nearly unfathomable mathematical complexity (despite appearing the least bit mathematical). The challenge presented here, of course, is that because our minds our attuned to see patterns, to see the “steadiness” of looping algorithms at work, computer-generated incidentals require incomprehensible levels of calculated variation to appear convincing; constructing a moving image of contingency, an image of the unplanned, requires an awful lot of planning. As with the snow particles in Frozen, these ornamental swaying leaves unostentatiously constitute a virtual world as physically convincing, quietly (but painstakingly) giving that world a sense of inhabitability and texture. The uncanny verisimilitude of these otherwise unremarkable representations attunes us to the extraordinary capacities and limitations of ordinary perception. As visual effects, they are meant to be absorbed but not noticed, appreciated but not appraised. Like their cinematic precursors, computer-generated incidentals offer more than simply a technological attraction. The incalculably complex fabrication required to generate the appearance of contingency awakens us to the impenetrable sovereignty of the viewed world, to the manner in which the world shows itself without regard for human comprehension. Returning to the virtual wind in the trees, Farocki’s narrator continues: “In cinema, there is the wind that blows and the wind blown by a wind machine. With computer images, there is only one kind of wind. A new constructivism.” If Parallel tells a story in which the parallel visual histories of cinema and CGI ultimately diverge, with computer images ontologically detached from the world that inheres in film, I wish to maintain a sympathy between them. Viewed on film, the leaves fluttering in the wind are just as contingent as the leaves blown by the wind machine: everything caught by film is accident. To say that something has the appearance of contingency, be it the fluttering leaves in Repas de bebe or the snow in Frozen, is partly what it means to describe cinema. Mulvey, Death 24x a Second. I’m referring here to Tom Gunning’s work that draws connections between 19th-century artistic movements emphasizing a new conceptual interest in motion—e.g. Futurism, Symbolism—and early cinema spectatorship. See Gunning’s “Loie Fuller and the Art of Motion” for a discussion of the aesthetics of fluidic motion in the popular Serpentine Dances of the 1890s. In 1905, Einstein published a paper investigating the phenomenon known as Brownian motion, which described the continuous but random movement of molecular particles. The conundrum had to do with the fact that the ceaseless, irregular movements of microscopic materials suspended in liquids challenged the second law of thermodynamics (the law of entropy), which stipulates that usable energy ultimately exhausts itself and dissipates in a closed system. Both microscopic Brownian motion and the collective trajectories of dust particles in early cinema involve the perception of a particular kind of uncognizable motion that refuses to be assimilated, either phenomenologically or empirically, into our understanding of the way objects ordinarily move. The problem of the uncognizable image that defies the boundaries of sensory apprehension is generally reserved for Kant’s category of the sublime. In fact, as the passage that marks the very end of the “Analytic of the Beautiful” and the beginning of the “Analytic of the Sublime,” we can understand “beautiful views” as a bridge between the beautiful and the sublime. Kant’s two categories of the sublime—the mathematical and the dynamic—respectively cover the problems of excessive magnitude (the mountain too large to perceive as a totality) and danger (the threatening thunder clouds observed from a safe space). In each case, the feeling of the sublime involves the superiority of reason over the imagination—I can mentally fathom the mountain’s totality but cannot perceive it—but Kant’s description of “beautiful views” seems to imply the opposite case: the imagination is undoubtedly stirred (“they still charm the imagination because they sustain its free play”) but the understanding cannot conceptualize the perception since it’s perpetual motion defies any semblance of objecthood. Whereas “form” was central to Kant’s transcendental psychology, it shouldn’t be surprising that the very notion of “form” was anathema to Bergson’s process philosophy: “There is no form, since form is immobile and the reality is movement. What is real is the change of form: form is only a snapshot view of a transition” (Creative Evolution, p 302). I’m referring here to the definition of “cinephilic spectatorship” that Christian Keathley outlines in his Cinephilia and History, or The Wind in the Trees. Importantly, what Keathley describes is not precisely a fascination with recorded motion but with recording as such, with the that-was-thereness characteristic of Barthes’s punctum. I’d be remiss here not to mention the rendering of incidentals in hand-drawn animation. In fact, more than any account I can think of, Eisenstein’s attraction to the “plasmatic” qualities of Disney animation gets closest to an aesthetic account of fluidic incidentals. Beyond the protean pliability of cartoon characters, plasmaticity is manifested in “the play of waters,” the “interplay of storm clouds,” and most of all, the sight of “fire…capable of most fully conveying the dream of a flowing diversity of forms.” But I want to maintain that computer-generated incidentals can achieve a verisimilitude that can’t be achieved by hand-drawn animation. While with CGI we can trace a trajectory toward photorealism, hand-drawn incidentals exhibit a vast variety of effects, each capturing an aspect of the represented phenomenon and thereby testifying to its complexity. For two vastly different examples, see the water effects in Winsor McCay’s Sinking of the Lusitania and Amy Kravitz’s River Lethe. The complexity of constructing fluid forms from a mass of moving particles seems to be part of the beautiful visual gag of the Lego ocean in The Lego Movie. See Ryan Pierson’s “On the Nonessential Beauty of Legos” for more on this. “In a movie house, the actors are not present in person and the screen is metaphysically unbreachable; the abyss between actor and audience is as bottomless as time. This does not mean that accidents are out of the question. One can say, as I have implied, that everything caught by film is accident, contingency. Then one must equally say that every accident on film becomes permanent (like the existence of the one world, in the midst of all possible worlds)” (Cavell, The World Viewed, 229).